solarise: a sea of all colors is a celebration of the story, architecture and patrons of Garfield Park Conservatory. Inspired by the groundbreaking and innovative vision of Jens Jensen—the designer of the Conservatory and godfather of naturalistic landscape and conservatory design—Luftwerk’s series of art installations echo Jensen’s sentiment for public interaction with nature, highlighting and elevating the importance nature plays in society and urban planning. 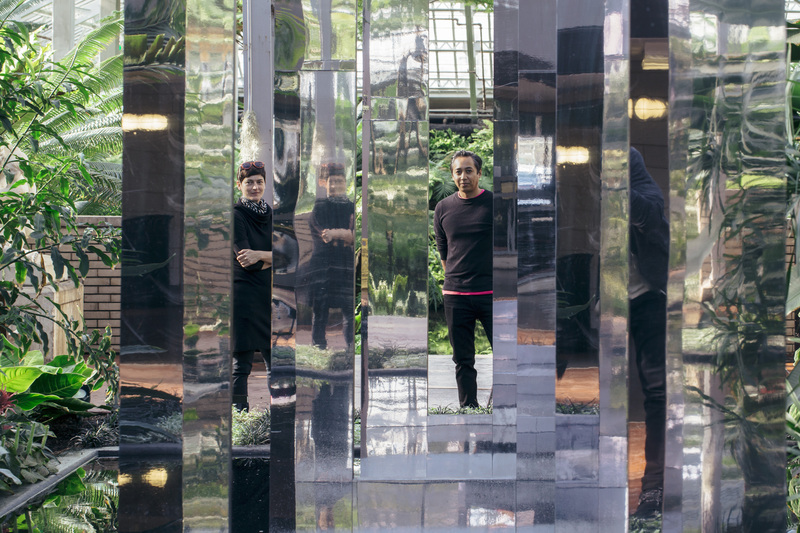 A site-specific response to the Conservatory, solarise is comprised of five dynamic, immersive installations: The Beacon, Portal, Florescence, Seed of Light, and Prismatic. Each artwork invites visitors to interact with color, light, and nature in new perspectives, heightening awareness for the viewer’s natural surroundings, the relevance of Jensen’s visionary landscape, and the architectural and societal significance of the building and its grounds. 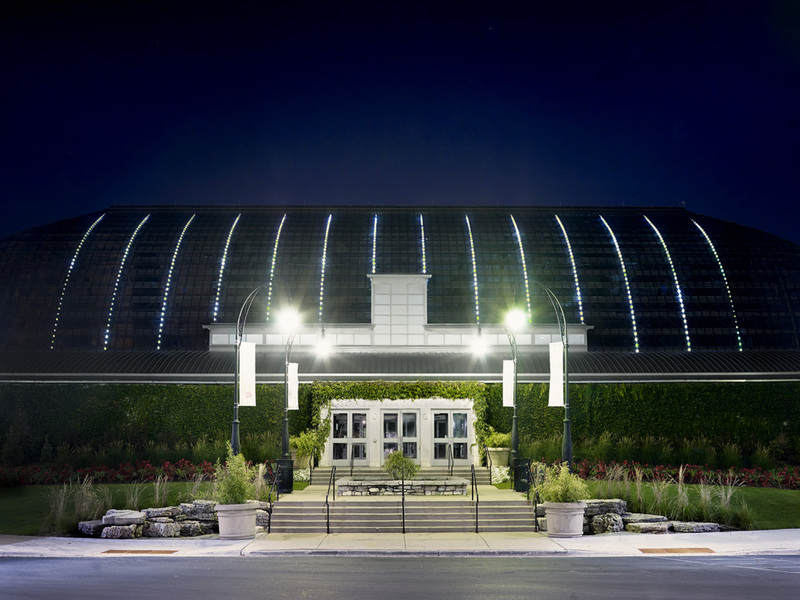 Paying homage to the conservatory’s patrons, groundskeepers and Mr. Jensen, himself, power requirements for the entire exhibit are offset through solar panels. 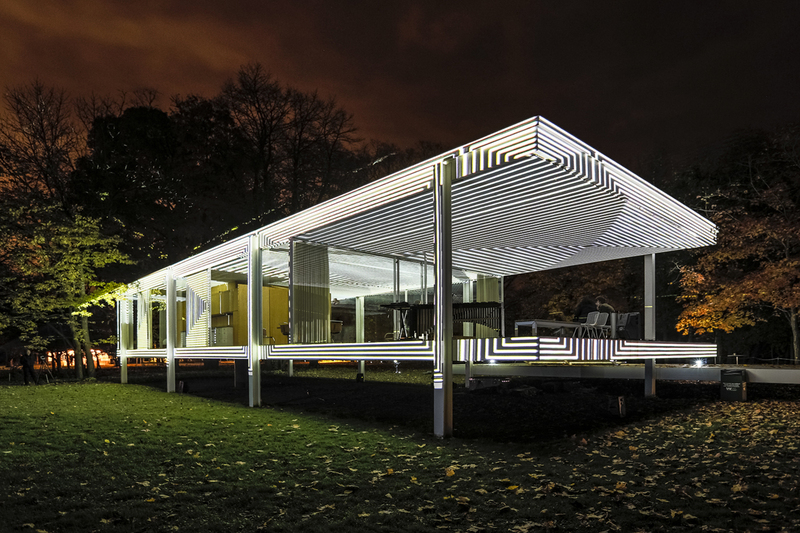 In October 2014, Luftwerk transformed Mies van der Rohe’s historic Farnsworth House into a revelatory canvas of light and sound through their installation titled “INsite”, resulting in a reanimation of our understanding and appreciation of an iconic architectural space. The four-night installation acted as an exploration into Mies van der Rohe’s architectural philosophy through a dynamic display of light, video-mapped in such a way as to engage the structure of the house, the fluidity of its transparent glass walls, and the organic – where natural form meets man’s geometry. This fall, Matthew Rachman Gallery will present “INsite ONview” featuring artwork by Luftwerk and photography of the 2014 installation of “INsite” by Kate Joyce. INsite ONview is an exhibition of limited edition photographs and dynamic, kinetic ephemera based on the installation, its documentation, and further musings on the storied house. The gallery will host an opening reception Friday, September 11 from 6 – 9 pm, at which all artists will be in attendance. The exhibition will run September 11 – November 8, 2015.
is the aesthetic look or visual appeal of a location – lawn, porch, windows, door, roof – from the curb. For the 2015 Terrain Biennale – an exhibition occurring in multiple outdoor locations – Curb Appeal re-envisions the way people use their homes – lawn, porch, windows, door, roof – as potential intersections of community play, food production and artistic creation through artistic transformation. Jim Duignan has installed a seesaw, A Plea for Playgrounds, and podium; Public Podium for 6018North, to reimagine how front lawns and porches can be interactive playgrounds and community spaces. Luftwerk (Petra Bachmaier and Sean Gallero) have installed Degrees of Lightness in the windows, Sarah Mallin has transformed the roof into a garden, and Moises Salazar has created a community mural on the garage door using the front door color design of IIT architectural students (Dea Ivanovic, Meriem Sakrouhi and Luis Yanez) as a thread of color that connects back to front. Since the home is an icon of the American Dream, if we can rethink the way homes are used we can then reimagine how other spaces and resources are used. This exhibition highlights artwork produced at the IEA in Alfred, NY, established in 1997 to support projects by artists working in digital media. 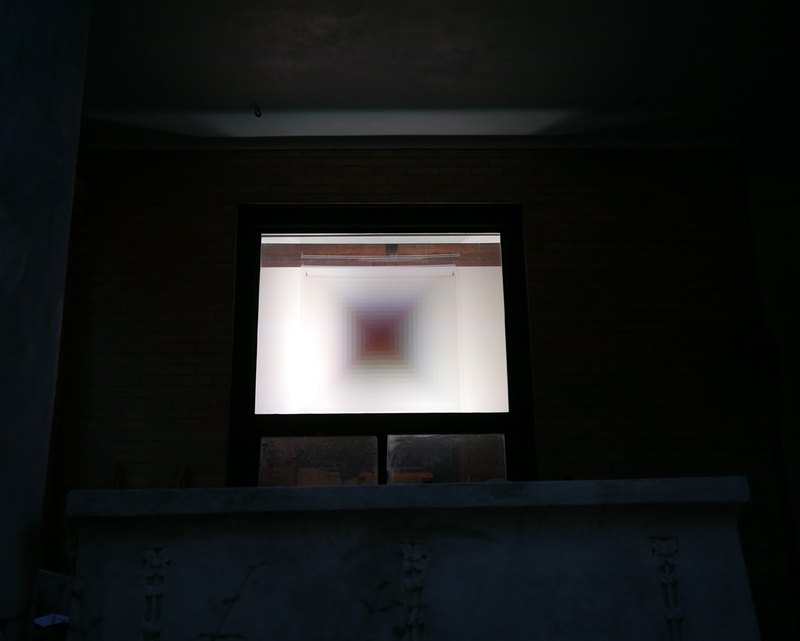 Resident artists include: Cory Arcangel, Brandon Ballengèe, Xu Bing, Robert Brinker, Matilda Essig, Ann Hamilton, Oliver Herring, Pamela Joseph, Xiang Jing, Luftwerk, Joseph Nechvatal, Chi Peng and Kiki Smith, to name a few. 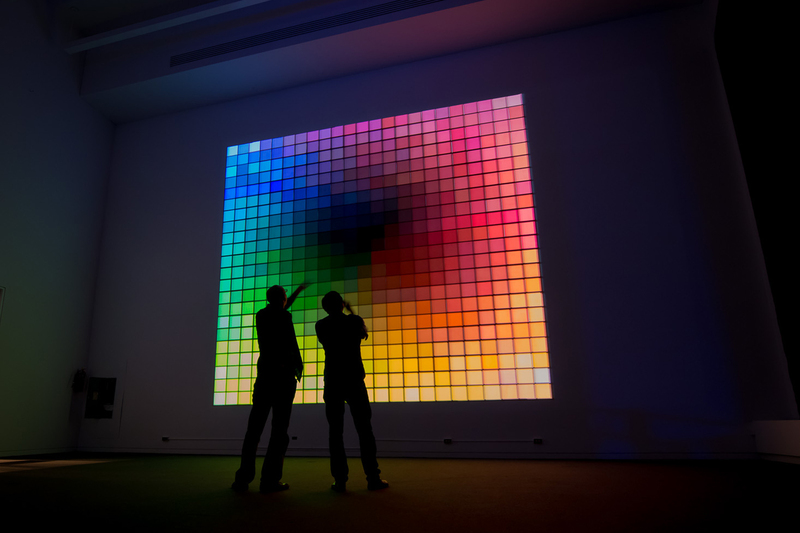 Luftwerk exhibits Spectrum a digitized and re-imagined color wheel composed of 529 squares that, once illuminated, meld into more than 3,174 tones of red, yellow and blue. This mutable continuum features color in interaction with light, varying and mixing to create nearly endless possibilities for color perception. INsite at Farnsworth House, Ludwig Mies van der Rohe, has been selected as an outstanding public artwork by Americans for the Arts, and is included in their 2015 Public Art Network—Year in Review! 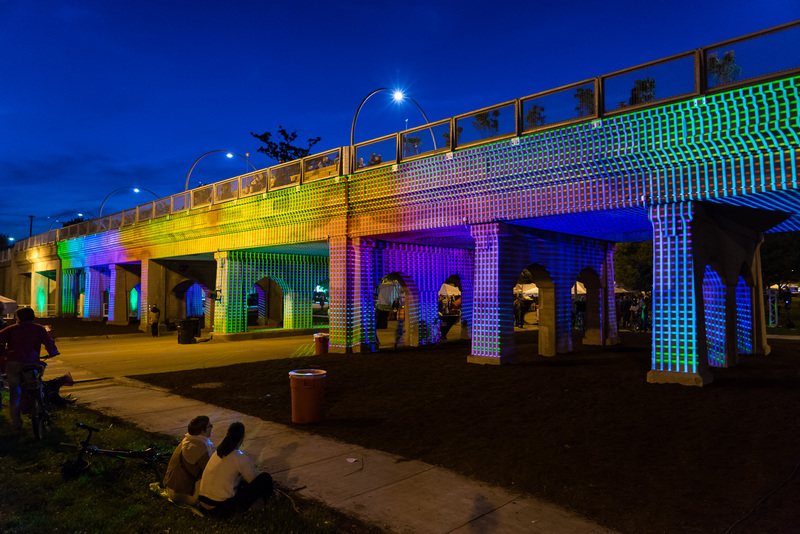 Coupled with original music by Owen Clayton Condon, transLIT illuminates the viaducts of Humboldt Boulevard with vibrant imagery inspired by flora and fauna, celebrating Chicago’s newest public park – The 606. Inspired by the elements of water and light, Luftwerk presents two excerpts of recent installation-based works that merge the two into an ephemeral experience. 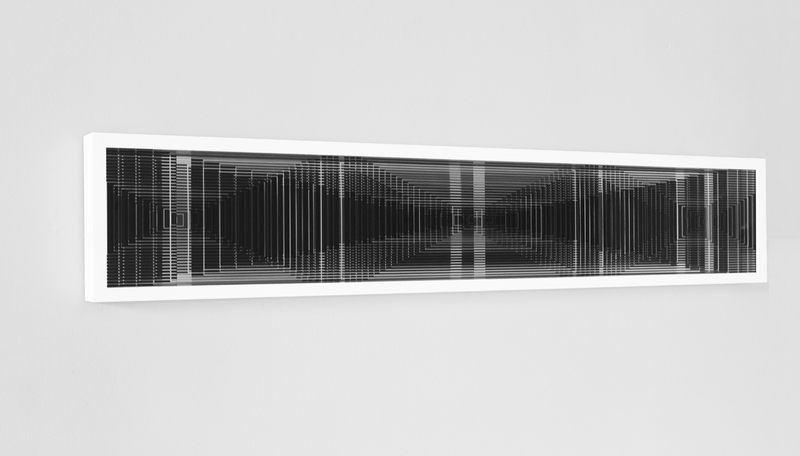 FLOW visualizes data from the Chicago River with projected video onto a water mist screen. 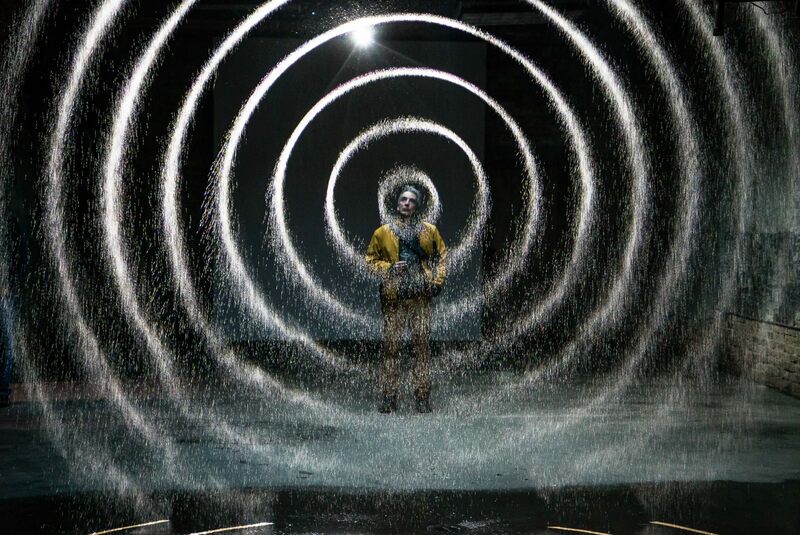 DROP illuminates a ripple from a single droplet of water, creating a circular pattern that expands outward. Closing reception: May 29th, 6 – 8 pm | Live performance by Rempis/Abrams/Ra: 8:30-10:00 p.m.
Rempis/Abrams/Ra, three of Chicago’s premier musicians: Aerophonic Records founder and transcendental saxophonist Dave Rempis, avantbass player Josh Abrams, and iconic drummer Avreeayl Ra. FLOW / Im Fluss was made possible through the generous support of the Goethe Institut of Chicago and the ACTIVATE initiative from the Chicago Loop Allaince. Luftwerk received an endorsement of Innovation from Surface Magazine The American Magazine of Contemporary Design. Scaped is a showcase of installation artists working in different media and seeking to transform interior space into a surreal survey of ecosystems creating new terrain. The exhibition is conceived to be an artistic ecosystem, with each artist contributing a signature work that functions as its own terrain or habitat. In this exhibition, a landscape will emerge and reveal a larger ecosystem – all in stark and monochromatic white. By confounding the viewer’s notion of interior space with a wild re-envisioning of natural forms and landscapes, this show explores the body’s relationship to itself and the relationship of the body to its environment. 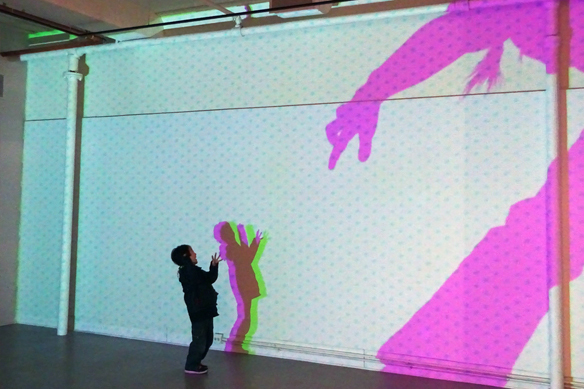 Scaped features installations from Brent Fogt, Kim Harty, Dan Hojnacki, Luftwerk, Kate McQuillen, and Neha Vedpathak. Curated by MK Meador.